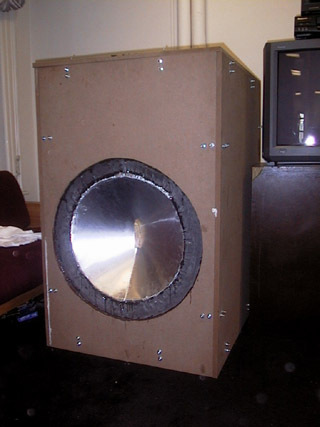 Mjolnir (also spelled Mjollnir) is currently the largest subwoofer at Random Hall, and quite possibly the largest subwoofer at MIT. With the 23 inch cone and over 38 cubic feet of volume, this speaker has no problem shaking the entire building. 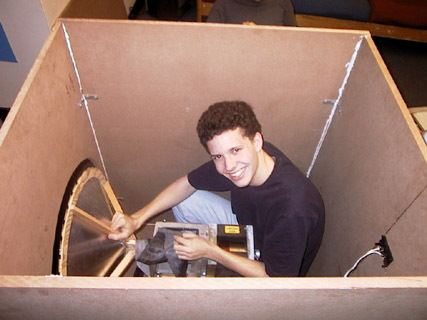 It was built from scratch in early December 1999 by a group of students at MIT. The total cost came out somewhere around $100. Mjolnir consists of lots of medium-density fiberboard, lots of bolts, a sheet metal cone, and a giant linear motor stolen from a circa-1985 dishwasher-sized hard drive. It takes a minimum of four people to lift it. More recent photos, along with more information on the speaker, will be added here sometime in early January. If you're lucky, I might even be able to snag a video clip of this thing in action (it's crazy).